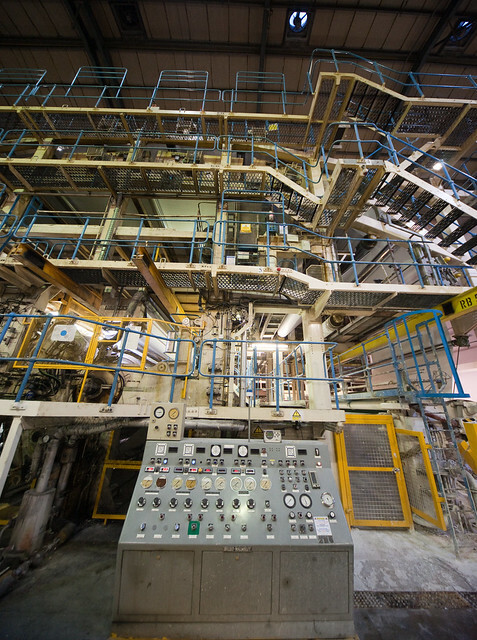 The “wire” where pulp is laid out to drain most of it’s water – these used to be made of copper wire, but are now a plastic, and it costs £10,000 to replace every six months or so. 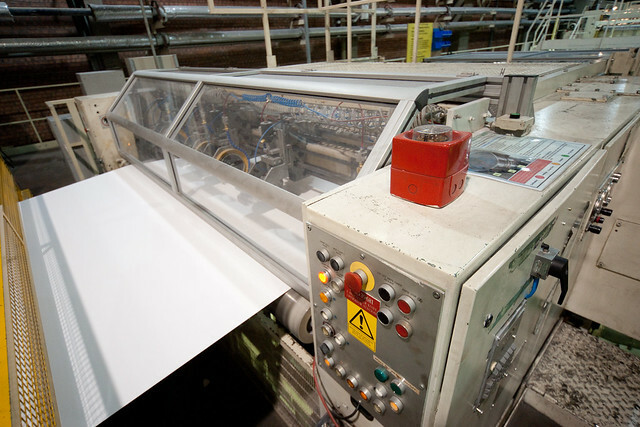 This machine is a “twin-wire” machine – a second wire on the floor below also produces a sheet of paper, and the two sheets are pressed together – here you can see the sheet from below coming up. 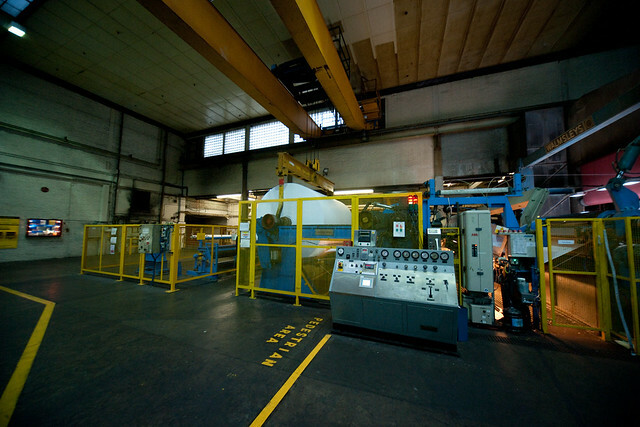 The big box on the left of this is the dryers – they’re called slalom dryers, where the paper is pressed on a felt belt and runs up and down through a series of steam-heated drums. 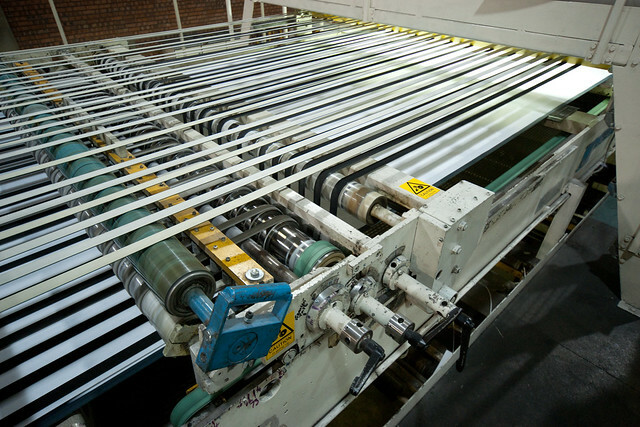 In this particular machine, a middle stage adds liquid starch to bind the paper layers more strongly, then the paper is dried again. 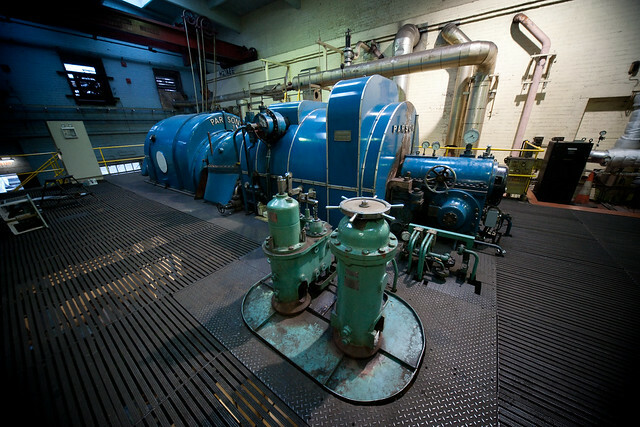 The end result – 99.5% water went in at the other end, a 12-ton roll of paper comes off here. 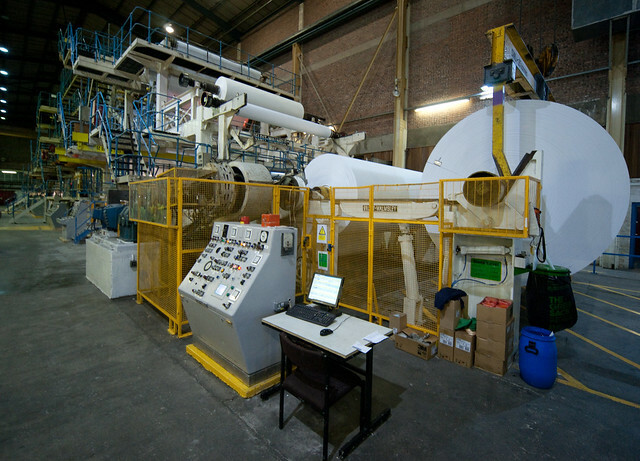 The machine doesn’t stop, as soon as one roll is done the next roller is already running up to speed, and takes up the supply seamlessly. 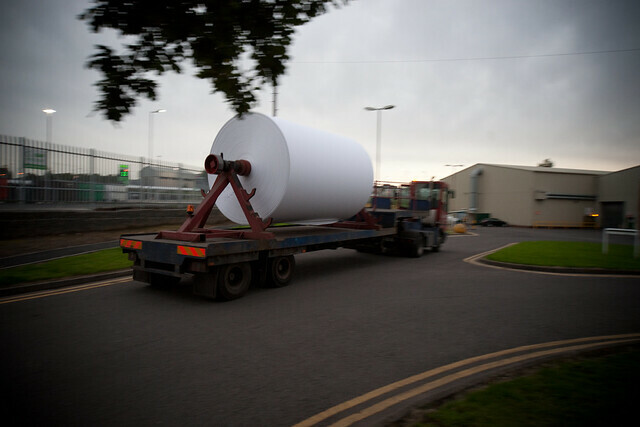 The paper made here is often coated, so the giant rolls are transported on special trailers to the coating machines. 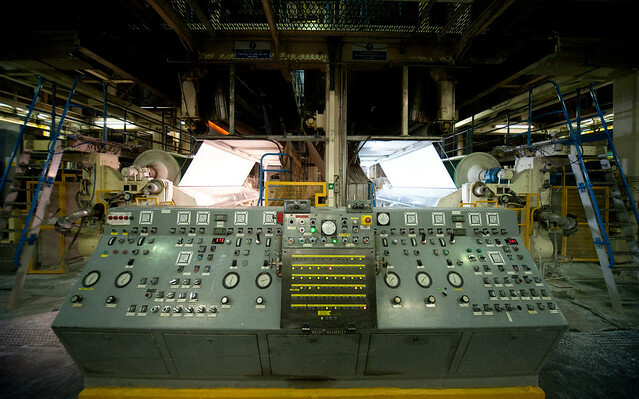 This machine is simply gigantic – it also goes about a floor level below here, and there’s about 800 feet of paper in the machine at any one time. 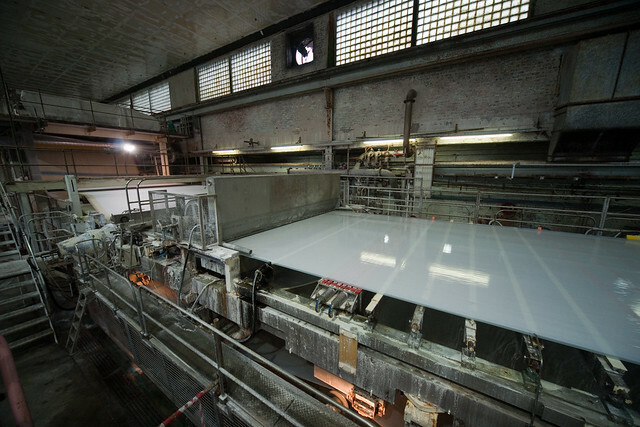 The coatings are a mixture of chalk and other additives – first one side of the paper is coated, then it’s dried using infrared lamps at 800-1000 degrees – the paper goes so fast that it doesn’t burn. 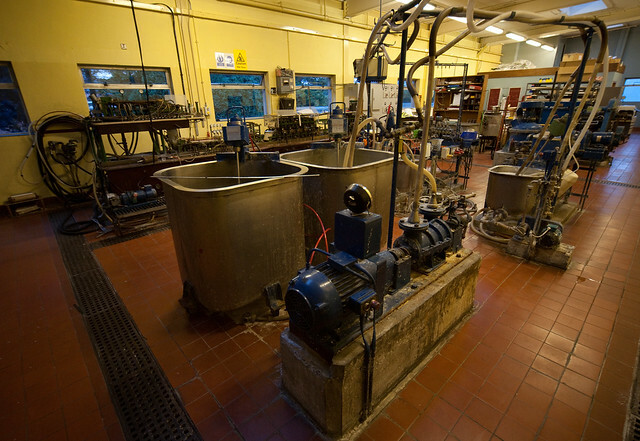 The the second side is coated and dried, then smooth rollers polish the surface. 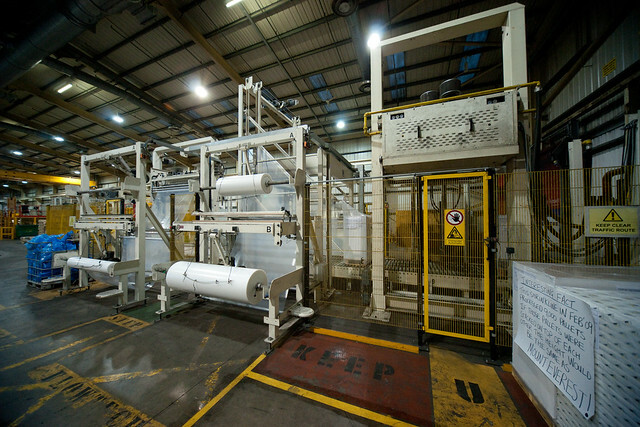 The rolls of paper then go onto the cutting department, where this automatic machine first slices the paper lengthwise then across the width – all at a speed of 180 metres a minute. 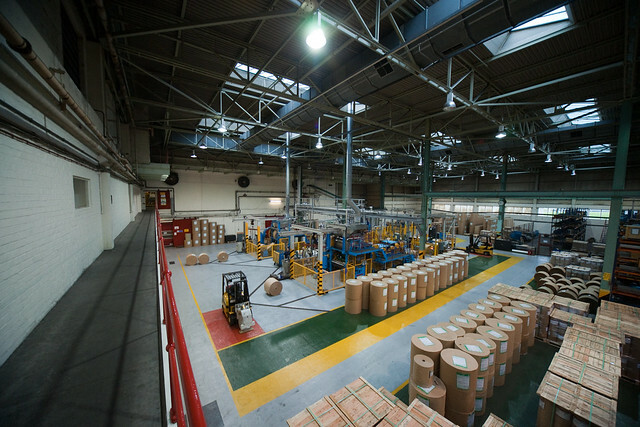 The sheets are then interleaved, then finally stacked on pallets. 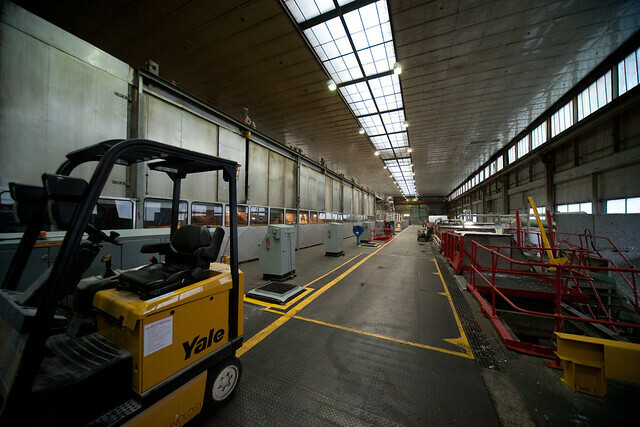 The pallets are then transported to an automatic heatshrinking machine where they are wrapped up, then loaded onto lorries. 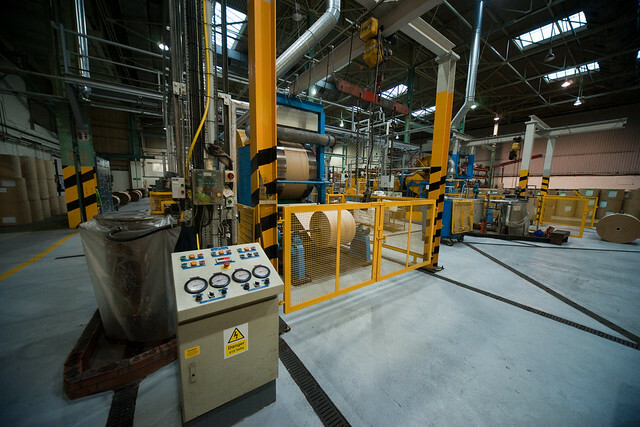 One thing TR specialise in is creped paper – this is used with resin to insulate cables including very high voltage ones. 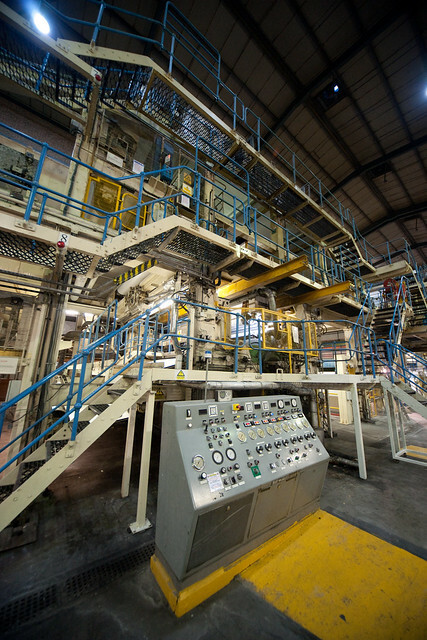 TR don’t make this paper – they buy in smooth brown paper, then run it through their creping machines. 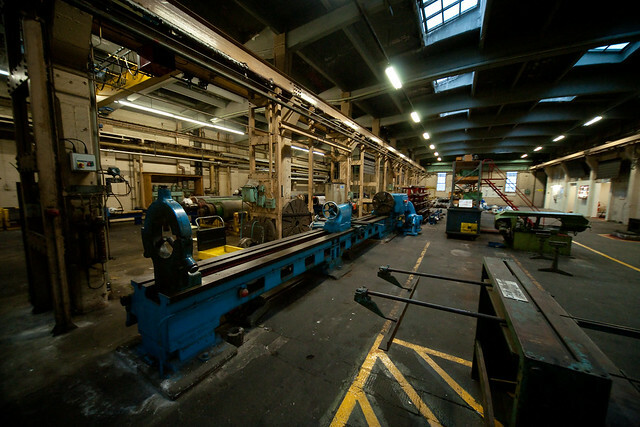 Then onto the workshops – an elderly retired worker remembered when there were 35 men working here, with foundry and the ability to amke almost anything needed in the mill. 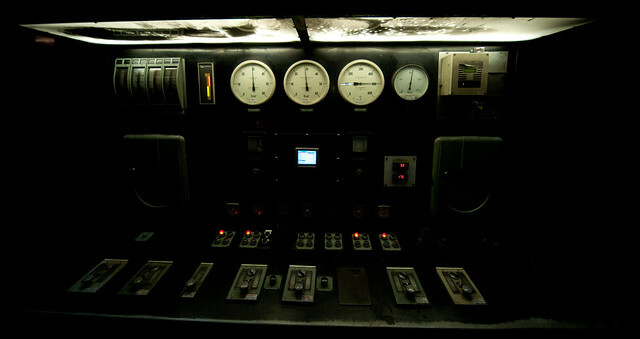 Now only four people work here, but there’s still some serious equipment. 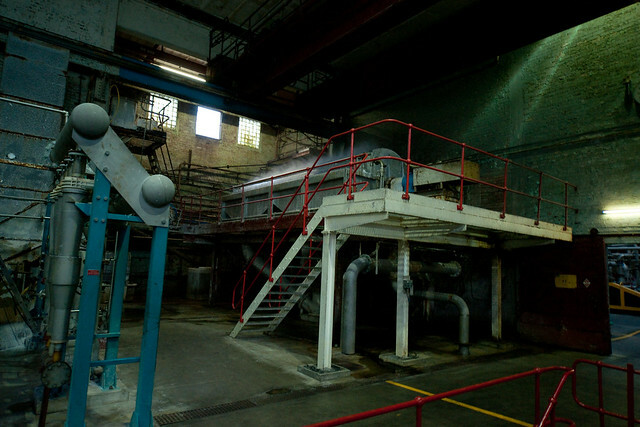 Next to the workshops is the power plant – this 16MW coal and oil fired power station will be replaced by the new wood-burning plant. 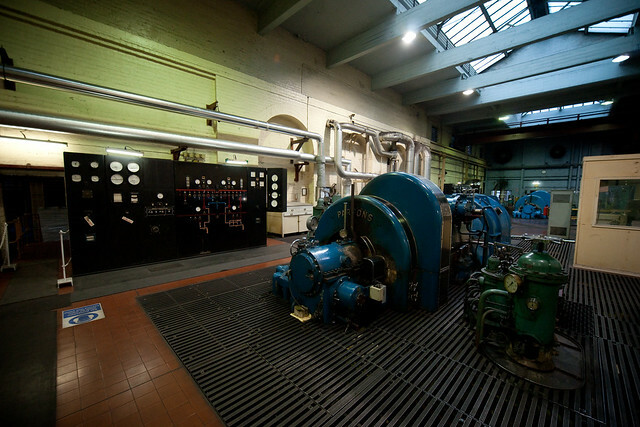 It’s got three absolutely lovely Parsons turbines. 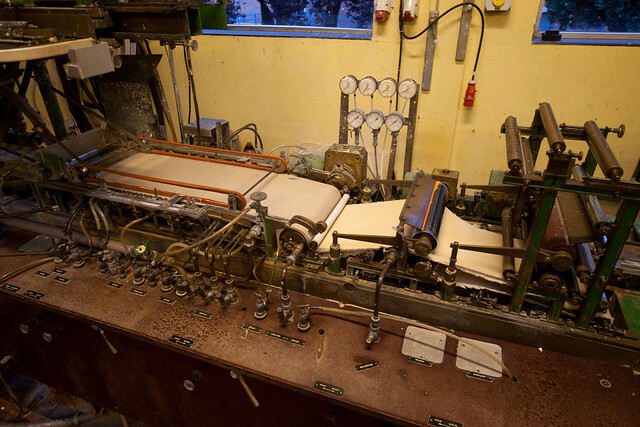 Finally, onto a lab where there’s a fully working miniature paper machine – made in Germany in the ’60s, and used for small experimental batches. 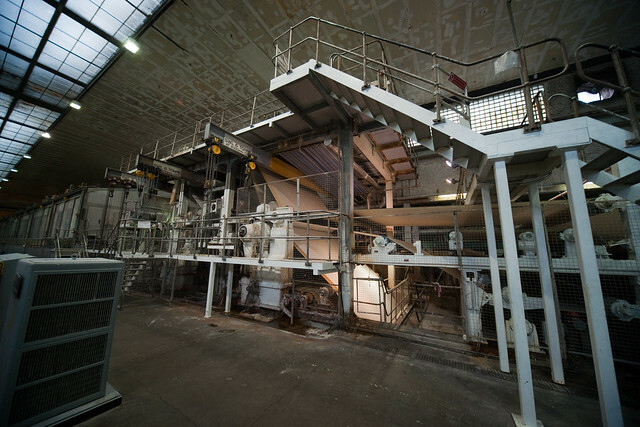 Next to the paper machine are miniature beaters, pulp mixers, cleaners etc – it’s an entire paper mill in miniature!